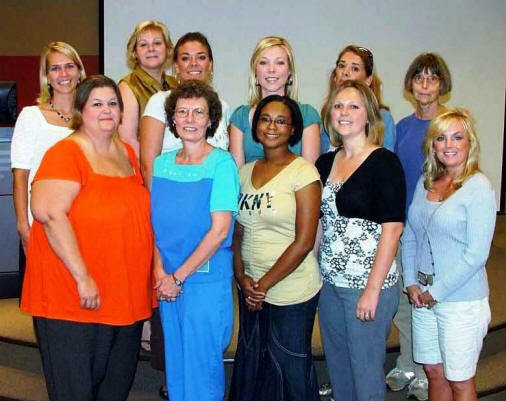 Sept. 9, 2008 -- Thirteen regular standing part-time students were admitted to the Department of Social Work’s new Master of Social Work (MSW) program at Arkansas State University this fall. The Department of Social Work is a department of ASU's College of Nursing and Health Professions. This first class of regular standing students, who do not have a bachelor’s degree in social work or whose bachelor’s degree was awarded more than six years ago, began attending classes August 26. The first class of Master of Social Work students admitted to the regular standing part-time program at Arkansas State University—(Front Row) Judy Perry, Robin Patten, Terri Clark, Pamela Diaz, Keena Waleszonia. (Back Row) Maria Tinsley, Cecilia Alexander, Tera Quinto, Kristina Lloyd, Catherine Gilbow, Virginia Esposito. The new MSW program will graduate students who will be able to fill needed positions in a range of agencies throughout northeast Arkansas and the lower Mississippi Delta region. Jacinto stated the Department of Social Work will admit its first advanced standing students into the program in summer 2009. Advanced standing students hold a bachelor’s degree in social work awarded in the past six years. In the 2009-10 academic year, the MSW program will admit both part-time and full-time classes of regular standing and advanced standing students. For more information on the Master of Social Work program at ASU, contact Dr. George A. Jacinto at (870) 972-3982, or by e-mail at gjacinto@astate.edu.